Tag line: "Two great lovers of the screen in the grandest of romantic comedies"
A few days ago, I was watching a video interview with Frank Capra Jr., during which he discussed his father’s 1934 film, It Happened One Night. According to Capra Jr, leading lady Claudette Colbert was less than enthusiastic about the movie, and even told her friends that she thought it was the worst picture she’d ever made. Obviously, the Academy disagreed with her. 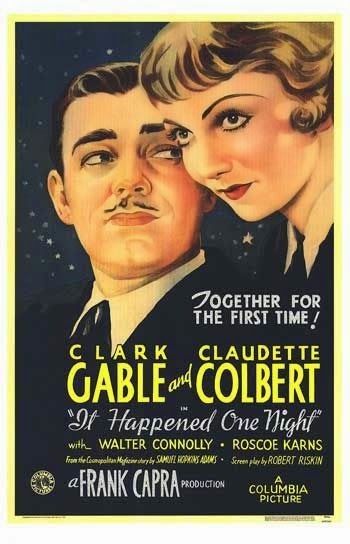 Not only did It Happened One Night capture the Oscar for Best Picture, but it also won awards for its director (Capra), lead actor (Clark Gable), writer (Robert Riskin), and, yes, Ms. Colbert, who took home the Oscar as that year’s Best Actress. In fact, It Happened One Night was the first movie to win all five of the Academy’s top honors, a feat that wasn’t duplicated until 40+ years later (by 1975’s One Flew over the Cuckoo’s Nest). Watching it today, I can see why voters fell in love with it; It Happened One Night is a charmingly whimsical romance. As the story begins, wealthy heiress Ellie Andrews (Colbert) is being held captive aboard a yacht by her father (Walter Connolly), who objects to her recent marriage to famous aviator Westley (Jameson Thomas), and is doing everything he can to keep the newlyweds apart. Determined to see her betrothed, Ellie escapes and heads to the nearest bus station, hopping aboard one bound for New York. It’s here that she meets Peter Warne (Gable), a no-nonsense reporter who, in a drunken stupor, quit his job with a big city newspaper. Hoping he can still get it back, Peter agrees to accompany Ellie on her journey in exchange for an exclusive on her story. But as their trip drags on, these two traveling companions, who have nothing in common, begin to fall in love with each other. If Claudette Colbert did indeed have doubts about It Happened One Night, she didn’t let them affect her performance. Her character’s transition from naïve rich girl to love-struck young woman comes across as 100% genuine, and Colbert (who, despite the fact she wears the same outfit through much of the movie, looks radiant) is the reason why. Her co-star, Clark Gable, also shines, playing Peter as a thick-skinned newspaperman who knows how the world works. It’s his fast-thinking that keeps them a step ahead of the detectives hired to find Ellie, and some of his streetwise wisdom even manages to rub off on his pretty companion. In one of the film’s most famous scenes, Peter is teaching Ellie the art of hitching a ride, yet fails to wave a single car down. So, Ellie gives it a try, but instead of holding out her thumb, she lifts her skirt and shows a little leg, at which point a car screeches to a halt. As for Capra, he injects enough warmth and humanity into these characters to turn what might have been a predictable story into something much more appealing. My favorite scene takes place on the bus, and has Peter and Ellie (as well as the other passengers) being entertained by a small musical group, which, to pass the time, is belting out an impromptu version of “The Flying Trapeze”. Eventually, other passengers join in, each singing a different verse. It’s a boisterous bit of fun, but just as the scene draws to a close, Capra tosses some drama into the mix by introducing a young boy who starts to cry when his mother passes out. Peter, who rushes over to help, learns that neither the boy nor his mother have eaten anything in days (they spent all their money on bus fare). This subtle combination of frivolity and pathos would become a Capra trademark, with many of his best films tickling our funny bones while they also tug at our heartstrings. Along with its sweep of the Academy Awards, the National Board of Review selected It Happened One Night as the best movie of 1934, and it continues to wow audiences even today (in 2006, the Online Film & Television Society voted it into its Hall of Fame, an honor it shared with Nashville, Rashomon, The Rules of the Game and The Third Man). A smart comedy with plenty of heart, It Happened One Night deserved every award it won, and probably more besides.